Also serving communities of Salem. There are 14 Assisted Living Facilities in the Payson area, with 3 in Payson and 11 nearby. The average cost of assisted living in Payson is $2,400 per month. This is lower than the national median of $3,346. Cheaper nearby regions include Santaquin with an average starting cost of $1,750. To help you with your search, browse the 37 reviews below for assisted living facilities in Payson. On average, consumers rate assisted living in Payson 4.4 out of 5 stars. Better rated regions include Spanish Fork with an average rating of 4.6 out of 5 stars. Caring.com has helped thousands of families find high-quality senior care. To speak with one of our Family Advisors about assisted living options and costs in Payson, call (855) 863-8283. The city of Payson forms part of the Provo-Orem metropolitan area in Utah. Home to a number of annual events such as the Scottish Festival, Golden Onion Days and the Salmon Supper, it’s an attractive location for seniors looking for a lively, historic neighborhood. There are three assisted living facilities within the city and 11 more nearby that provide residential options for seniors. The state licenses two types of ALFs, which differ primarily in the level of care they provide. These facilities are regulated by the state’s Bureau of Health Facility Licensing, Certification and Resident Assessment. Utah implements a 5 percent flat income tax statewide that includes Social Security retirement benefits, pension income and income from retirement accounts. Although seniors are entitled to a small credit against these taxes, the net deductions can still leave less money at the end of the month. The American Lung Association ranks the Salt-Lake-Provo-Orem metropolitan area as the 18th most polluted U.S. city in terms of ozone pollution, and the 8th worst for short-term particle pollution. As part of this metropolitan area, Payson may pose risks for senior residents with respiratory health issues. Although Payson’s overall cost of living rates a 112 (on a scale with 100 representing the nationwide average), it is lower than the state’s overall average of 118 and the Provo-Orem metro area’s 119. This makes it a more affordable spot within the local area. The city’s grocery index shows a lower value of 91, keeping seniors’ daily supplies at more reasonable costs. The city enjoys a generally comfortable year-round climate, rating a comfort index of 71, far better than the US average of 54. With annual snowfall at 59 inches, far above the national average of 26 inches, the winter months may keep seniors away from outdoor activities. Payson has an array of community resources for seniors, including a Senior Citizens Center that accepts members for a minimal membership fee, which is waived for seniors 80 years old and above. The center serves as a recreation area, offering access to games, books, computers and art classes, and monthly birthday celebrations and outings provide social opportunities. The Payson area is home to world-class medical facilities, including Mountain View Hospital, in the event of medical emergencies or illness. Assisted Living costs in Payson start around $2,400 per month on average, while the nationwide average cost of assisted living is $4,000 per month, according to the latest figures from Genworth’s Cost of Care Survey. It’s important to note that assisted living rates in Payson and the surrounding suburbs can vary widely based on factors such as location, the level of care needed, apartment size and the types of amenities offered at each community. 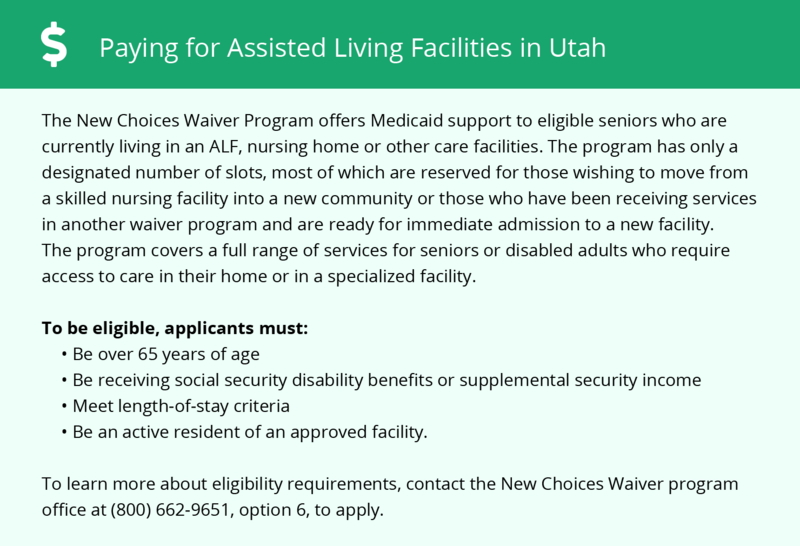 Utah offers the New Choices Waiver program to individuals residing long-term in licensed assisted living facilities. 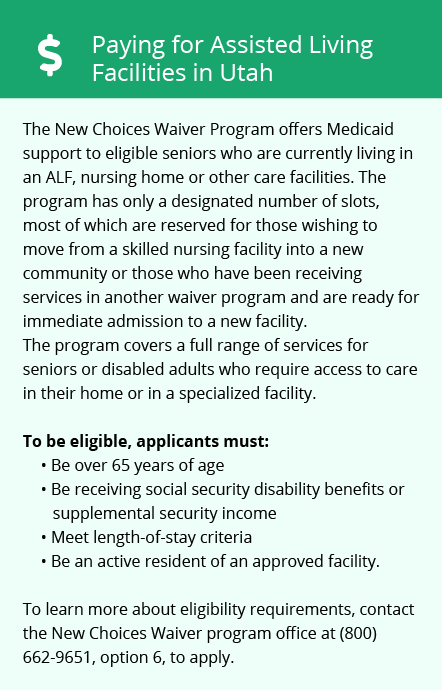 With this program, eligible applicants may receive an expanded range of services through Medicaid. Applicants are required a minimum length of stay to qualify and are given access to the program’s available services based on their assessed needs. Payson and the surrounding area are home to numerous government agencies and non-profit organizations offering help for seniors searching for or currently residing in an assisted living community. These organizations can also provide assistance in a number of other eldercare services such as geriatric care management, elder law advice, estate planning, finding home care and health and wellness programs. To see a list of free assisted living resources in Payson, please visit our Assisted Living in Utah page. Payson-area assisted living communities must adhere to the comprehensive set of state laws and regulations that all assisted living communities in Utah are required to follow. Visit our Assisted Living in Utah page for more information about these laws.